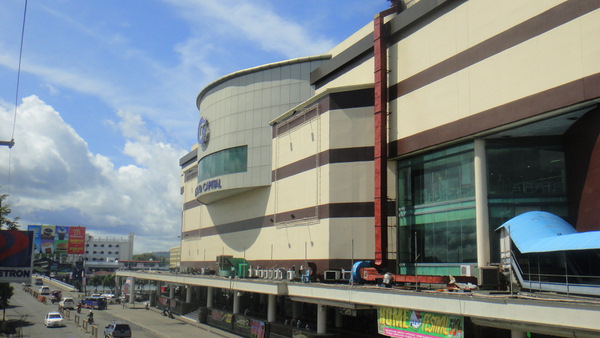 Gaisano City located in the Lapaz district of Iloilo used to be one of the most popular shopping destinations in the area. My asawa and I had only visited the store once since an initial visit after first moving to the Philippines over two years ago. We weren't overly impressed, and the air conditioning (or lack of it) did not make it one of our favorite places. Good air con and the variety of shops offered at SM City is why you will see that particular mall written about numerous times on this website. However, since our move to a subdivision outside of Iloilo City recently, we need to buy some new furniture. Aside from a sofa bed we hauled on jeepneys and a pump boat from Guimaras, we do not even have a chair to sit on, just a small plastic stool we bought for 82 pesos (1.91 USD Dollars) and only big enough for a duwende. Since Gasiano has a large selection of furniture and appliances to do our Philippines shopping we decided to revisit the mall one Sunday. But first things first. We had to get our priorities in order. And Number One on the list was a new rice cooker for my spouse. She had left her old cooker in Guimaras for her Mother, niece and nephew. 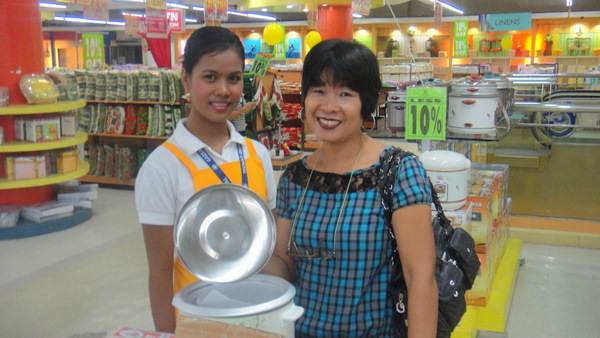 A cute Filipina sales associate, pictured with my beautiful asawa, is shown in the photo above and helped my wife look at the vast selection of rice cookers offered. 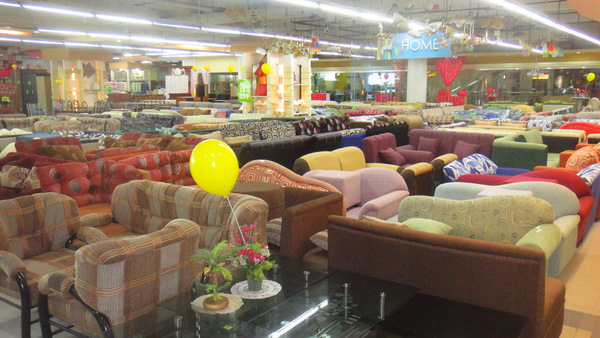 We decided to check out the large furniture selection the store offers, in fact if you are going to do some Philippines shopping for new beds, sofas, wardrobes, etc., Gasaino City in Iloilo would be a good place to visit. Take a look at the next photo which gives you an idea of what they have to offer. We need a new bed since the sofa bed we have been using the last two years is not at all comfortable and is hurting my asawa's back. Found some very friendly and helpful sales associates. My wife was looking for a new wardrobe to hang our clothes. Our new home, like our former place in Guimaras, does not have one single closet. Large wardrobes to hang your clothes is not a necessity but a great convenience. It beats taking your clothes out of open suitcases which we currently do every morning. As my spouse took a call on her cell phone and was chatting with her sister in Manila, I wandered over to the beds and mattresses. As I entered the bed section I was greeted by a trio of male associates, not a cute Filipina in sight in that area. The guys don't work on commission but still offer great customer service. Took a look at some headboards for 4,000 pesos (93 USD) and a queen- sized mattress priced at 8,000 pesos (186 USD.) This was not some piece of foam which we had been using when we first moved to the Philippines, but was a regular good quality mattress like we had in the States. We were just windowing shopping that day, but I took the price information from the associates as I waved my asawa over from the wardrobe area, her mobile still glued to her ear, so she could offer her opinion. I was hungry and wanted to check out the food court which opened at 10 am and was able to steer my spouse upstairs. We checked out the limited selection of food offered, just a few dishes sitting in serving containers with no fast food outlet in sight and made a "bee line" to, you guessed it, "Jollibee." You can always count on the well-fed Red bee to serve up some cheap eats. Fortunately there were no long lines, and I was able to place my usual order promptly, a Champ Burger, hold that sweet mayo please. I politely advised the young lady taking my order that I love the burger but do not care for the mayo topping so if it is on my Champ I will promptly send it back. The associate took my order directly to the line cook and emphasized that there was to be absolutely no mayo. I love great customer service! My Champ Burger arrived without the sweet mayo (always takes as least 12 minutes but I do not mind waiting.) My asawa chomped down on some spicy Chicken Joy as we weighed our Philippines shopping options. We did not have the cash to purchase any bed or wardrobe at this time and hopefully would be able buy them next month. Gaisano City charges 750 pesos (17.50 USD) for delivery to our subdivision about 30 minutes outside of Iloilo City so it would be make sense to purchase both items at once and avoid another delivery charge. Had to see what the budget would allow and hope that the US dollar would not continue to fall against the Philippine peso. However, my overall impressions of the mall were considerably better than our initial visit. The air con situation had seemed to improve (or else I was getting better acclimated to the heat and humidity in the Philippines.) While there are not nearly as many dining options available as SM City offers and not as many as stores, we will be returning when we are able to buy the furniture we are looking for. We want to pay in cash and want to avoid racking up any charge accounts if possible. We do not have any credit cards and do not want to fall into that trap as was so easy to do back in the States. So if you are in the area, drop by the mall. It was a nice change of pace from our usual SM City shopping adventures. I just hope that "Hello Kitty" mattress is still available, though, but don't let that get around! Really, I didn’t know that about Gaisano, Tiya. Well, I have to tell you that the store clerks that waited on us were very helpful. To be honest, I don’t shop at places where the clerks have “more attitude than the customers” I didn’t in the States and have rarely encountered that in over two years of living in the Philippines. And I was going to address the bee as ” the fat red bee,” but I was trying to be more gracious since I do love the bee’s food. Plus, I’ve always found good customer service there, too. The worker bees seem to understand my English Slang accent better than the help in various McDonald’s outlets in Iloilo do. My fondest memories of Gaisano in Ormoc was the looks that the sales ladies would give Jho (MBA). They would look at her from head to toe. When they caught me watching them do this, their eyes would look down at the ground. I asked another American friend if he noticed the same thing with his asawa and he did. My best purchase was a paid of Islanders that fit my size 14. Someone at Sabin Resort also liked them because they were missing after a swim. My second fondest memory at Gaisano was when I was separated from Jho and a filipina tried to pick me up. This really surprised me since I’m tall and ugly. Dave is good looking compared to me. Well, you certainly have me beat in shoe size. I only wear a size 11. I’ve heard some stories about the malls in the Philippines and being approached by filipinas. I certainly won’t forget the young lady with the baby that wanted to visit me at our house in Guimaras even after I told her I have an asawa. So the chances are pretty good that you will run into the young lady and Dave Jr now. haha! Well if you come to visit you will leave either laughing or crying. There is no in between with someone like me I am afraid. For any kind of appliance including a rice cooker or a toaster I would recommend Imperial Appliance ? Why ? 1. They have always backed up their warranties with me without wuestion. 2. Reasonable priced (bout the same as anywhere else) 3. Can do 50% down and do low or zero interest for 6-12 months now. 2. I’d recommend you take a look at Mandue foam for a real materss and other furnature. Quality stuff that lasts at reasonable prices. 3. The only thing I buy is shorts and shirts from the mens section on the second floor of Gaisano. I also don’t like the lack of decent ac and the loud music played on cheesy speakers :). I will add to your plug for Mandaue Foam. We have bought pretty much all of our furnishings from them here in Gen-San. My wife had two sofas from them before we met. They had a nice design but they were a hideous Barbie pink. When we started looking for furniture I suggested that we give these away. When we were at Mandaue they told us that if you buy furniture from them that they will reupholster it whenever you want for a reduced price. We had the two sent to their factory in Davao and recovered at a low price with the same fabrics that they use on their new furniture. I don’t actually remember the cost but I was shocked at how low the price was at the time. Imperial Appliance here is okay but I had an issue that I wanted to talk with the manager about and he refused to talk to me. I saw him peeking out at me from upstairs. I told the sales girl that he was relaying message through that I would be happy to go up and see him if he is too lazy to come down. The only thing that stopped me from canceling the sale was that I used my debit card from the US and I felt sorry for the sales girl that worked hard to process it for 30 minutes on the phone. The girl explained that the manager was afraid of foriegners as he had been verbally attacked in the past. I asked her to tell him that I said it was shameful to have a 40 kilo girl do his job because he is afraid. I hope that she relayed this but I bet she didn’t. That was my one time in two years that I almost became the ugly American. Hi Tom, I also have bought most of my furnature through Mandue foam. It’s all in good condition many years later and felt I paid a “reasonable price”. Too bad about the Imperial Appliance down there. I’ve been dealing with them almost 10 years now in Iloilo and never had a problem with either getting a warranty replacement on the spot or getting an ans on wether they were going to replace/repair the appliance within 3 working days. I am not at all a shopper like my wife. She has to visit every mall to see which one offers the best price. For me it’s more about customer service. I’d much rather pay a few hundred or evan thousand pesos more knowing if I have a problem, it will be taken care of and not “forgotten” like other places in the past. Well, Tom, if both Paul and yourself recommend Mandaue Foam we’ll check it out. I know that sofa bed we bought from SM City is hard on my asawa’s back, and she’s not getting proper rest. As we all know, it is imperative to ALWAYS keep the asawa happy. Barbie pink, huh? Well, if we find something we like we might have to “avail” of their low cost reupholstering services. It’s too bad the gutless manager at Imperial Appliance would not speak to you. Perhaps I encountered a similar problem when I was having difficulty getting my Smart Bro installed at our new house and asked to speak to a manager. I have the tenacity of a pit bull and wasn’t going to get off that phone no matter how many times I was told a manager wasn’t available. I’m sure the message was relayed to their bosses that an upset American was on the line wishing to speak to them. But to be there in person and have an employee do their dirty work for them and don’t have the intestinal fortitude to deal with you face-to-face. Well, that is shameful. Ok, Paul, I will check out Mandaue Foam for a bed and mattress. If Tom and yourself both recommend it, it must be a good place. Imperial Appliance? Paul, I’m not sure I found the right place you told us about. We stopped at the Imperial Appliance Plaza right across from SM Delgado in Iloilo. I honestly wasn’t that impressed, but we did see a Centurn TV and Appliance Store on the same block as SM Delgado. Might that be the place you told me was like a Circuit City? That said, we could make another visit to Imperial, the Centurn store wasn’t open last Sunday when we went and check both places out. Well, the longer I stayed at Gaisano, the worse the AC seemed to get. The Christmas music is loud. I guess the workers just have to block it out. The Boss and I will check out Mandaue and Imperial before going back. Thanks for the info, it’s appreciated.